UPDATE 6/1/2008 Now that the yoga challenge is over, I’m no longer updating the calendar below. Thanks to everyone who contributed! We raised at least $223 for Larkin Street Youth Services. I’ll be sending out an email detailing how to make your donation. On May 1st, I started a 30-day yoga challenge at my local Bikram yoga studio. The challenge is to try to improve one’s practice in some capacity and reach previously unmet goals. Some people will practice every day for 30 days, some will do a double session in the month, others will try not to look at the clock during practice for the entire month. I will try to practice 5+ times per week, which is already proving to be very challenging indeed. I went on the 1st, 2nd, 3rd, 5th and 6th, and had planned to go today, except when the time came around I had a headache and was pretty exhausted, so I took a nap instead. I woke up and was so hungry that I couldn’t resist eating, which means that I’m missing the 6:15 class as I write this. I’ll skip today and try to move some stuff around tomorrow so that I can keep the challenge going. Doing a lot of yoga is of course very good for me, but the other reason I’m doing this is that it’s very good for others as well. As part of the challenge, we can raise money for a non-profit called Larkin Street Youth Services, which is dedicated to getting young people off the streets of San Francisco, getting them cleaned up and back in school or a vocational program. I’m asking the reader(s) of this blog to donate as much as they want per yoga session that I complete. You can donate $1, $5, 50 cents, whatever you wish. Just send me an email or comment here to make a commitment, and I’ll keep track of what you owe. Alternatively, if you choose to just donate a lump sum, that’s fine also. Checks should be made payable to Larkin Street Youth Services, and if you enclose a self-addressed envelope with your check, I’ll send back a receipt for tax purposes. If you have any questions about the program, visit the website, or ask me directly. And if you don’t want to contribute, that’s fine too. I’ll be keeping the above calendar up to date, so check back to monitor my progress! Wikio recently ranked this blog as number #291 for Music blogs! Yay! Thanks to my loyal readership (Jeannie) for all of your dedicated work. C’mon Jeannie, let’s get this bad boy up to 289! Despite my Waldorfian upbringing, I’m not schooled on the details of Greek mythology – otherwise I’d attempt a wise crack along those lines. But rather than embarrass myself, I’ll just put it like this: My Master’s thesis from UC Berkeley’s iSchool (then S.I.M.S.) 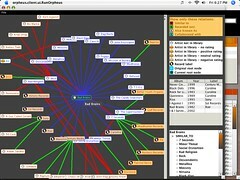 was a music exploration and discovery tool called Orpheus. It was well received in 2005, and ever since I’ve been promising/threatening to resurrect it and try to improve some of the more compelling features and turn them into a web-based application. This latter part is in the works, but the first two steps were to get the Orpheus server installed and running, and make the Exploration Tool/MP3 Player client available for download. These two steps, I’m thrilled to announce, are completed! Orpheus is all about mining a wide variety of information about music from Internet sites like Last.FM, Pitchfork Music, and Wikipedia; from structured sources like MusicBrainz and Freebase; from users’ music libraries, and from user contributed metadata, and turning this information into knowledge that can be used to discover new artists and explore the musical universe in novel ways. It’s about finding compelling new means of exploration and discovery. As several of our professors pointed out at the time, our approach could prove useful for exploring the corpora around many other types of media – books, academic articles, movies, etc. But my primary joy and passion is music, so music is the first and foremost focus of this project. 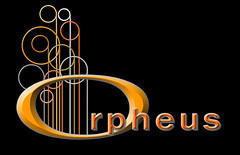 Without further delay, you can download the Orpheus client and start using it right away. If you are new to Orpheus, you might benefit from watching this slideshow first. Before you get too excited, the rich information that Orpheus collects hasn’t been updated in a while (I’m working on adding new feeds and cleaning up the feeds we currently have). So you might not find too much about new artists in Orpheus at the moment. But don’t let that stop you! Please be sure to contact me with any problems or bugs you encounter. And stay tuned for updates and new features. Okay, so maybe you can’t actually use Orpheus right now, but you can finally take a look at the interface and get a sense for the application. I spent a few hours this weekend taking screen shots of my beloved Master’s thesis (created with Vijay Viswanathan and Jeannie Yang) and putting them online with some explanatory text. You can check out a slide show of Orpheus’ main functionality right here. If you’re looking for the database documentation or older project documents, you’ll still need to visit the thesis site. I’d like to say in the coming weeks you’ll see more content online about Orpheus, but that’s probably not going to happen. The main motivation to post this stuff online is that as a professional I have something to point people to when I talk about what Orpheus did and what it is capable of. As part of this process, I also compiled and installed both the client and server on my local media machine. Orpheus still looks cool, and is still enormously fun and satisfying to play with. The music landscape has changed a lot in the last two years, but I still love the idea of Orpheus. So sad! This morning I picked up the Times on the way to work and saw this article about CBGB closing its doors permanently. I remember reading a few articles about the problems between CBGB’s owner Hilly Kristal and the venue’s landlord, but the front page article in the Times this morning still surprised me, and made me get nostalgic for the punk rock 80’s and post-punk 90’s. I’ve only been to CBGB a couple of times, but I still hold my attendance up as a badge of punk rock honor. It was 1989, and me and my friend Byron Hipp drove up to New York in my dilapidated Dodge Coronet. I can’t even remember the headlining band, to be honest, but I’m pretty sure the opening act was 24-7 Spyz. I remember how totally punk rock I felt, hanging out at CBGB. I knew I had to really enjoy it, since I was prohibited from going to New York by my mom, and when I returned to DC, it was a foregone conclusion that I’d be grounded and car-less for at least two weeks. CBGB is gone, and its time had probably come. It is sad to see such a landmark, an historic icon of ‘underground rock,’ punk-rock and the New York music scene shut down. But I suppose I can take solace in what Patti Smith said during the closing show last night: “CBGB is a state of mind. There’s new kids with new ideas all over the world. They’ll make their own places.” The way things are going, the places those kids make might not even be physical places, but let’s hope she is right. Out with the old, in with the new, I suppose.